Hot on the slithery tail of the snake encounter, our eyes were drawn to this strange looking creature we found in the road. 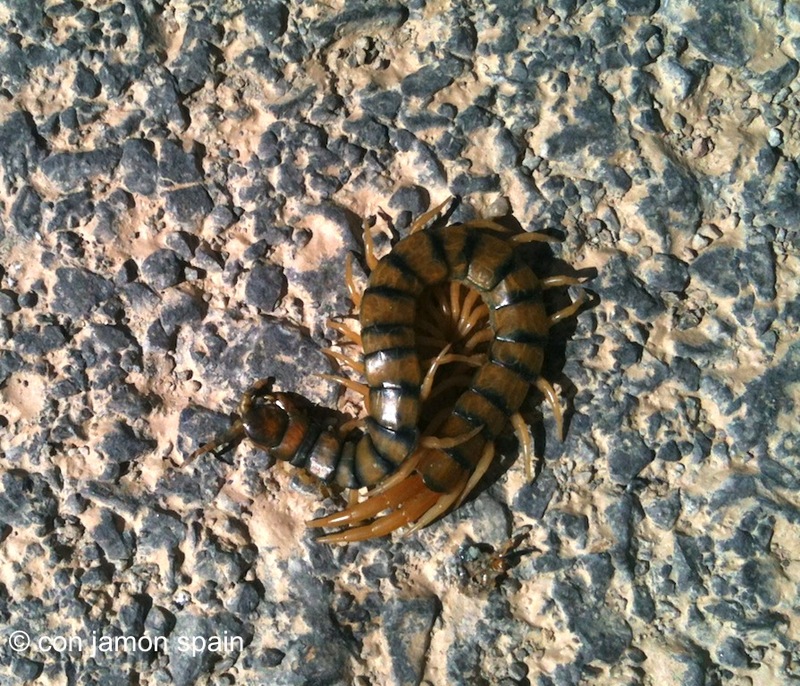 We’re no nature or wildlife experts but believe it’s a Megarian banded centipede (Scolopendra cingulata). It’s one of the few of the species found throughout southern Europe – although it is common in Spain, as well as countries like France and Greece. It can grow up to 10cm long. Apparently its sting is painful – it injects poison via its front feelers. Others in the Scolopendridae family – elsewhere in the world – are more dangerous. We’ve no idea why it was sunbathing on a road as hot as an oven baking tray – they normally like sheltered, stony ground and come out at night. In 2012, English newspaper, The Olive Press, ran a story about it – and it attracted a stream of comments. They’re not too popular it seems. Some people have lived in Spain for years and have never seen one. I saw one running across a path in my garden a couple of years ago. I figured it might be “dangerous” in some way, because of the yellowish bars on its back. EEwwwww! That is one disgusting looking creature. We met someone just yesterday whose son found one on his bed the night before! I think I’d move house!